This historic brewery is a warm, captivating place to host wedding festivities and events. Restored murals cover the walls, depicting Milwaukee and Pabst’s past in bright colors and beautiful frescoes. Blue Ribbon Hall transports guests back in time to celebrate in an area surrounded by Americana in warm ambiance that perfectly complements any event. Built in 1858, Blue Ribbon Hall is located in what was once a Milwaukee Public School. Old World charm and history radiate through the décor, a nod to Milwaukee’s German roots. Lantern-like chandeliers, gleaming wood floors, intricate windows and bright frescoes contribute to the specific warmth and charisma of this hall. 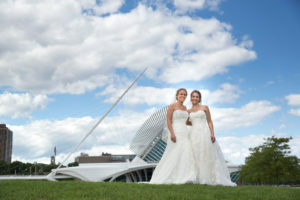 Corporate events, social functions and wedding receptions will be an absolute success at this venue, which embodies the simple life so enjoyed by early Milwaukee breweries. Blue Ribbon Hall is an entertaining, fun place to host wedding receptions and ceremonies. It is also ideal for any number of wedding festivities, including showers, rehearsal dinners and engagement parties. The space provides a historic, charming backdrop to your celebration and can easily transform to accommodate your style and personality. Blue Ribbon Hall can accommodate standing receptions of up to 225 guests, seated dinners for 120-175 or ceremonies for up to 120 guests. A number of corporate and social events can easily and charmingly be held in Blue Ribbon Hall. The simple décor elements entertain but don’t overshadow, and the entire room has an inviting, lively atmosphere that complements social celebrations, like birthday parties and anniversary parties, as well as corporate events, like company retreats, luncheons and holiday parties. This venue has a capacity of 225 guests for standing receptions, 120-175 for seated dinners, 120 for presentations or 175 for meetings. We were primarily in contact with Kim who responded to emails very quickly and clearly knew what she was doing which made us feel a little less stressed throughout the planning process. Kim was also very accommodating when we wanted to drop some things off earlier than the day of as well as us picking up some of our decor the following day, which we very much appreciated. Overall we loved the venue, our guests loved the venue too, and we can’t wait to swing by and enjoy a beer as a married couple there! We had an amazing time on the tour yesterday! It was interesting, informative and totally entertaining. Not to mention the building was absolutely gorgeous. Our guide was wonderful and very passionate and knowledgeable about everything Pabst! Next time we’re in Milwaukee, we will be back! Ask your event designer about adding a tent to your event at Best Place at the Historic Pabst Brewery – Blue Ribbon Hall.